Focus-based coupe, sedan and convertible. Let Ford have the hatchbacks. Make it sporty and young. Focus-based people-mover, 7 passenger. Let Ford have the 5-passenger version. Kuga-based crossover. Keep the look more urban than the Ford, which should look more rugged. Milan sedan redesign, with Cougar coupe version added. It's gotta be hot, yet upscale, like the '67 was in relation to the Mustang. I think all this could be done successfully with the right differentiation from its Ford sisters, and the right marketing. Let me know what you think the lineup should be comprised of. Phasing the brand out is off the table for this thread. Mercury is getting crushed because of the identity crisis of Lincoln. Till Lincoln becomes mostly RWD BMW, Caddy competitor Mercury will be mashed between it and Ford. To make the matter worse - Ford pushed Mercury out of existence with the Taurus. Mercury could be a good Buick of Fomoco. Another action plan will be to cater lower end models in luxury segment using M and make LM as BPG granted P does not exist. I would eventually like to see Mercury become entry level luxury (where Lincoln is now) if Lincoln can someday move back upmarket, but the reality is that probably won't happen for a long time. ...Phasing the brand out is off the table for this thread. In that time I've gone overboard with way too many models (for realism) and keep trying to cutback. I'd be very interested to know what any Spanish speaking members think of the name "MIGA"
I'd love to see a Cougar revival, based on the Mustang. No FWD Cougar, please. Do you think the DEW98 platform still has legs? Dew98 was the Lincoln LS/Thunderbird/Jag S type platform. The Mustang platform (S197/D2C) is different, though loosely based on Dew98. I assume it will evolve/be replaced w/ a next gen platform in 4-5 years. After Panther goes away in '11, the Mustang will be the only American Ford RWD car. The Mustang just was updated for '10, it will be around for another 5 years at least w/ the current platform. Leave FWD to the sedans. blu has some good ideas, all have merit, but i don't see ford granting more than 3-5 unique bodies for mercury. i think ford will try for the minimum with the mercury brand, and to me it means at least 2 of 3 models that have decent volume potential aside from their ford stablemates. i think mercury falls back on escape/fusion clones via mariner (or other name) and milan. i see them both getting 4 cyl and 4 cyl turbo only. although a mercury coupe of some kind could revive emotion in the brand, we are talking some form of capri (convertible) or cougar. with solstice and sky gone i could see merc trying to claim the 2 seat convertible realm but with what? then to me they end up doing it fwd. i don't see them as having the gumption to try a coupe. the people mover is a great idea, and while i don't think it has volume potential it might be something they can market to women which they seem to want merc to be.....ford for chicks. it would make more sense to me to simply let mercury offer the wagon version of the fusion. i would like to see lincoln still do the MKR. ford is going to have so much fiesta and focus based product, i am not sure if adding more mercury variants those similar sizes can work. my fear is they get lost in the shuffle, even if they are unique. 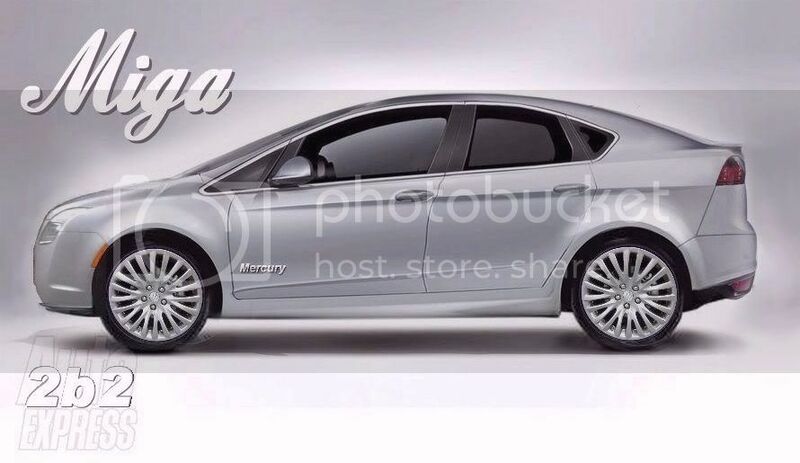 I would really like to see Mercury become Ford's NEW Buick, but I don't see it happening. They need a Focus size sedan and maybe a wagon or hatch, a more original Milan replacement possibly with coupe and wagon, a more original Mariner replacement, and some sort of convertible would be nice, but not as necesarry. I think a new crossover to replace the Mountaineer would help too. The problem w/ Merucry is that everything they have is better as a Ford in my opinion. Not a single one of their cars has an original interior which I think would help differentiate the vehicles alot. The problem w/ Mercury is that everything they have is better as a Ford in my opinion. Not a single one of their cars has an original interior which I think would help differentiate the vehicles alot. ...I've wondered if a mix'n'match approach could work? where Mercs could get some Lincoln pieces and some Ford pieces??? Since FoMoCo is creating luxury products for Lincoln off the company's FWD platforms, I think FoMoCo should take Mercury in a sportier direction. Mercury's lineup should consist of select vehicles from Ford of Europe's product portfolio that are assigned to Mercury as "brand exclusives" (meaning that there wouldn't be any direct versions sold under the Ford or Lincoln brands in the U.S. market). Mercury would be aimed at a specific demographic that prefers slightly premium sportier products that emphasize style over ultimate practicality. It would serve as a more upscale, style conscious alternative to the Ford brand in the U.S. market. Mercury would essentially become more of a sportier niche brand to compliment Ford's role as the high profile mainstream brand and Lincoln's role as the traditional premium/luxury brand. Mercury would still be slightly upmarket from Ford, but it would take on a sportier tone instead of the "faux luxury" image of its recent past. Mercury would still be a niche player in the U.S. market, but it would be a niche player with a specific image, purpose, and mission. * Lynx: Subcompact 3-door liftback coupe on Ford's B-platform. The Lynx would be a rebadged version of Ford of Europe's resurrected Puma coupe (Link: Auto Express: Ford's Baby Cat Is Getting Ready To Pounce). * Capri: Compact 3-door liftback coupe on Ford's C-platform. The Capri would be a rebadged version of Ford of Europe's resurrected Capri coupe (Link: Auto Express: Ford Capri Coming At Last). I do hope that the actual production version is more attractive than the speculative illustration in the Auto Express article. I am envisioning a 3-door hatchback with a slight notchback coupe profile; sort of like the Scion tC, but much more attractive and sexier. * Milan: Midsize 5-door liftback "coupe" on Ford's CD-platform. The Milan would be aligned with Ford of Europe's "coupe" version of the Mondeo (Link: Auto Express: Mondeo Coupe Curves Up A Treat). * Cougar: RWD 3-door liftback sports coupe. The resurrected Cougar would be built on the Mustang's D2C platform, but it would feature Ford's modern kinetic design language as opposed to the Mustang's iconic retro design. The Cougar would be sold under the Ford brand in foreign markets, making it a global car. * Maverick: Compact 3-door crossover "coupe" on Ford's C-platform. The Maverick would be a rebadged version of the "coupe" version of the Kuga CUV (Link: Auto Express: Kuga Coupe On The Prowl). * Mariner: Compact "MAV" on Ford's C-platform. The next gen Mariner would be aligned with Ford of Europe's upcoming next gen C-Max (Link: Net Car Show: Ford C-Max (2011) With Pictures And Wallpapers. The next gen Mariner would be marketed as more of an "urban lifestyle activity vehicle" instead of a traditional CUV. * Magellan: Midsize "MAV" on Ford's CD-platform. The Magellan would be aligned with Ford of Europe's next gen S-Max. Like the next gen Mariner, the Magellan would be marketed as an "urban lifestyle activity vehicle". Like the upcoming next gen C-Max, I would expect the next gen S-Max to have a cooler exterior design that would make it look less minivan-ish (Link: Net Car Show: Ford S-Max (2006) With Pictures And Wallpapers). To give a little more insight and perspective on the Ford/Mercury relationship: I view the Lynx/Capri/Milan/Maverick to have a similar relationship to the Fiesta/Focus/Fusion/Escape as the Scirocco/CC have to the Golf/Passat. The Mercury products are slightly upmarket sportier variations of comparable Ford products, just like the Scirocco and CC are slightly upmarket sportier variations of the Golf and Passat. * Fiesta: Subcompact 5-door and sedan. * Focus: Compact 5-door and sedan. * Fusion: Midsize sedan. Next gen aligned with next gen Ford of Europe Mondeo sedan. * Mustang: RWD retro styled sports coupe and convertible. * Escape: Compact CUV. Next gen aligned with the 5-door version of the next gen Ford of Europe Kuga CUV. * Explorer: Midsize unibody SUV(?). * Super Duty: HD truck. * Transit Connect: Compact commercial van. * E-Series: Fullsize commercial van. * MKR: Compact sedan on a stretched version of Ford's C-platform. Styling would be strongly influenced by the MKR Concept. * MKZ: Midsize sedan. Next gen version on Ford's CD-platform. Exterior styling will be completely distinct from its Ford Fusion/Mondeo platform mate. * MK3: Compact retractable hardtop coupe on a stretched version of Ford's C-platform. * MK6: Midsize retractable hardtop coupe on Ford's CD-platform. * MKC: Compact CUV on Ford's C-platform. * MKX: Midsize CUV on Ford's CD-platform. Exterior styling will be completely distinct from its Ford Edge platform mate. * Ford Thunderbird: Retro styled personal luxury coupe built on a stretched version of D2C fitted with an IRS. * Continental S & Continental C "By Lincoln": RWD midsize sedan and retractable hardtop coupe built on the Thunderbird's stretched version of D2C fitted with an IRS. The Continental products would be marketed as a semi-separate flagship series under the Lincoln brand that would be targeted at European sport/luxury products. Continental C = retractable hardtop coupe (or coupe-cabrio). I like a lot of your ideas, cire. The euro Capri we've seen renderings of would make a perfect fit for Mercury, for example. The tagline could be "Miga Please!" Wow... I had to talk to a 13 year old about how that is inappropriate Only, he was saying the word "riga" which means "ruler"